Another year, another give away. Simply click the logo to the left to join the give away yourself. Proud to join for another year. This year is different to say the least. Read on and you will find that I have been diagnosed with stage 3 breast cancer. I am almost finished with the 8 treatments of dose dense chemo. That will take it out of you for sure. Next I will have the surgery and then radiation. All you need to do to win is leave me a message that contains your name and a way to reach you if you win. At the end of the Give Away, February 15th the winner will drawn and notified. I am sorry you are dealing with that miserableness, but I am so proud of you for fighting it! I would love to win a lesson from you! Thanks for offering a wonderful giveaway! What a creative idea, Linda:)Please drop in for a visit if you fly by.. I am sure that doll making helps you focus on positive things.Creating is soooooooo therpeutic. She is just beautiful! Wonderful work, please count me in the list! I'm so sad to hear about your fight! Please do stay positive and with the mindset that you're going to beat it, because you will, you know! You are in my thoughts! I love your ART and I wish you to win your fight! I am sending you warm thoughts. Beautiful girl and I would love to win a lesson too! My daughter has multiple myeloma. She went for a stem cell transplant a year ago and is in remission. Keep fighting and you will win. Your dolls are wonderful. They are so well crafted. I would love to win the one you have showcased as your giveaway. Please come on over for ride number 33 and check out my post as well. Please enter me in yours! I'm so sorry you're battling cancer. But it sounds like you're giving it the good fight and winning! I'm wishing the best for you and sending warm cyber hugs your way. Your doll is so charming, I love her! What a generous give away. Love your doll, she is so different from mine, and so fantastic. Love your blog and love your giveaway! Count me in , please. My mom had breast cancer a few years ago, she had a surgery and now she is ok. I guess I'm next :) Be strong, you can go through this and come out at the other end. Oh, I would love a doll making lesson. Thank you for that. You might enjoy listening to my husband John's music ...it is comforting! Oh how fun, what an awesome giveaway, would love to do a lesson. Love your blog and the music. Wow! My kind of giveaway....learning something new! Please count me in, and visit me and my offering when you can. What a wonderful idea. I would love to win a lesson from you as this is something I've never done. Please enter me in your drawing. If you should by chance pick my name would you then pick another person for my name... since I've taken this wonderful class already. Please enter me in your draw. Pop over to mine at #303 for a chance too. Oh how grogeous! Such a lovely giveaway. Well...at number 659 on the OWOH giveaway participants list, I feel like a bit of a late starter, lol! BUT please do count me in! So nice to have discovered your blog! wow I would be really interested !! this doll is beautiful. I am also so sorry to hear of your struggle. I hope things improve in the near future. I would love to win your tutorial. I have been so interested in making art dolls- this would be a wonderful prize. I am so sorry to hear about your breast cancer. Congratulations on almost finishing your chemo My mom is finishing up her chemo next month. It is so hard watching people you love hurting. I hope this year is full of healing for you. Love your doll and would be pleased to call her mine. Good luck with your surgery, I am a survivor of lung cancer, so anything is possible. Nancey, I'm so glad to see you blogging and feeling a bit better. You have been in my prayers along with your family. This Magic Carpet Ride is HUGE this year...I can't believe it! LOL Love your art doll and I would so love to win her! Feel better and love to you always. What a beautiful Freida doll. I love her! I'm #736. I'd love to learn to do your doll! It's so nice to meet you. I hope that all the visitors will be sending you the most positive and healing thoughts to comfort the way through such a difficult time. What a lvely doll - and a great giveaway! I love this little doll...I know she would be very happy here with me! !lol...Please add my name...thank you. I'm so sorry to hear of your illness, what a caring and generous thing for you to still be involved with OWOH. blessing to you and for a quick recovery. would Love to be in your drawing! I will say a prayer for you! You are so very brave!! Your doll is just lovely as ever..she is a treasure from the heart I can see. I'd love a chance to win it and cherish it forever. thank you and good luck with your treatment. Восхищена Вашей стойкостью! Вы победите! Спасибо! What a fabulous giveaway, please enter my name, thank you. Oh my goodness, what a generous giveaway! I am so sorry to hear of what you are dealing with right now, and wish you all of the best. My mom was diagnosed with cancer a few years ago and beat it. I know that you can too. I shall be thinking about you and your fight. Best wishes. I would so love to win her! I hope you stop by my blog #547 and leave a comment for my giveaway. glad I stopped by....please enter my name. It's Jan from Elk River, MN Barb Kobe's friend. I think about you often and always pray for you. I want you well and back in the community, we miss you! If you need anything- I will help. Your art doll is fabulous! Would love to be included! Love it! What a beautiful prize! Thanks for the chance! Tracy tcornell123@comcast.net TX, USA Visit my giveaway too: #783! Oh She is beautiful :) You're very talented. I hope all your treatment works out well - good luck. I am so sorry to hear about your struggle - I'm sending healing thoughts your way. Please toss my name into the pot - what a unique giveaway! What a gorgeous gift ! I was so happy when I saw your name on the list!!!!!! It has been quite here on your blog. I want so much for you to feel good again. I think of you often and send healing vibes your way. I wish I could do something more. That is the bad part about blog friendships, but maybe sending thoughts is more powerful than we know. I hope so! Please add me to the list. I would love to take one of your classes. I'd love to learn how to make a doll, my always come out less than I imagined. Your doll is intriguing! I am praying for you as you succeed in reattaining health! Wow, I am impressed with your courage, and also your artistic talent! She is just beautiful! Please sign me up! Many well wishes for you, also! disease from you. Please add me to the giveaway!!! You are in my prayers, picturing you completely surrounded by a rainbow of healing light! I would love to take one of your workshops...I love your dolls. Oh wow. This is a truly thoughtful giveaway. I will keep you in my thoughts as you continue your treatments. My OWOH giveaway is #79 on the magic carpet ride. I love the idea of a class for a giveaway. Great idea. Sorry to post here again. I am not entering my name for the draw again. I am just trying to contact you about the class I purchased Creating Vintage Looking dolls as I am unable to access the class or the group. Perhaps my mail is going into your spam folder. Please could you contact me please. Hi, Nancye: Your gorgeous work never fails to amaze me. I'm sorry to hear about your cancer and I pray that you will soon have a speedy recovery. Hi Nancye, Thank you so much for continuing to offer your classes and your talents throughout this difficult time in your life. We continue to prayfor your full recovery! It would be wonderful to take this class from you, such a wonderful OWOH offering! So sorry to hear of your illness! Best wishes to you! I'm new to doll making and would love, love to have this lesson! Wow, you're teaching while going through chemo? Even online, that's Wonder Woman stuff! And teaching something I madly want to learn, too! How I hope I can- your dolls are wonderful! So sorry to hear you're ill, wish you all the best for the future !! Love your dolls, and I would love a chance to win at your wonderful giveaway :) if you haven't already then, please stop by my blog, there's a giveaway there too, and I'd love it if you'd enter !! I love this giveaway so much. It really represents what OWOH is all about because the winner will surely get to know you better through your class. Please add me into your drawing. Thanks. I am so sorry to hear you are fighting the battle. Stay strong. I hope you are feeling the well wishes and support of many new friends on the carpet ride. Your doll is beautiful and I am sending you many hugs. Please visit my giveaway at # 585. What a gorgeous little art doll!!! I would love to be the winner! Please include me and come enter my giveaway too! You have a nice blog with a terrific giveaway! I would love a chance to win! I hope you are feeling well. Thank you for being willing to have a giveaway! Hi Nancye, what a lovely idea and post you have. I love the gorgeous primitive art doll. I'd love to win. I absolutely love your gifts. Please take time to visit my blog, too, for a chance to win my book, 16 x MOM: A Mastery of Motherhood. I'm working on getting all the country flags. I promise to revisit your's too. Greetings from Salem ! Hang in there Nancy God Bless you! So many creative giveaway ideas, this one possibly taking the cake :) I'm following so I can come back and visit you and your dolls! Hi Nancye, Wow thanks for sharing such wonderful giveaway with us! I'm saying a little prayer to win:) Glad you're back again for OWOH 2010. If you have time please visit my blog #450 all about Pretty! and my shared blog #534 The Vintage Chicks for my giveaways. I've just been looking at your gallery of dolls, they're all wonderful. I'd love to be able to create something like them, so thanks for the chance of your giveaway. Sending you healing thoughts and wishes Nancye and also thanking you for participating in this year's OWOH. I love your work - your creations 'speak to me' and I would love the chance of taking one of your classes. Nancye -- I pressed publish on my last comment before I was finished. I wanted to say I hope that your treatment is going well -- get lots of rest! Lovely blog! Great giveaway. Thanks for the chance to win! And, keep up the fight! Your dolls are so beautiful, Nancye ! I am sure that having time to create these wonderful creatures is some good therapy for all the ills that are ailing you. I hope you feel all the OWOH love and healing energy! I'm so proud of you for being a fighter! You will beat it! What a wonderful gift! If you are up to it, I would love for you to stop by my giveaway. But if you don't I totally understand. Gentle Hugs! dear Nancye, keep hanging in there, you are in my prayers. I know you will get through this, I can't wait to see you back on your Ning network...we need you there..
what a very nice giveaway. thanks so much for the opportunity to enter the drawing. so delighted to meet you through this event. I hope you'll stop by my blog as well. p.s. get better real soon. here's wishing you the absolute best. Nancy so sorry to hear about your breast cancer, hope all the Chemo and tablets etc, get rid of it for you. Such a lovely prize give away, please count me in. Keep my fingers crossed for you to get better and you will be in our prayers tonight. What a lovely piece of artwork you have make. Wonderful giveaway! Drop by my blog #968.
p.s.... I hope your feeling better soon! I pray you'll be fully recovered from this awfulness. Nancye I have been keeping you in my prayers and thoughts. Please count me in your wonderful giveaway!! And visit mine as well :o) Hugs! I'm sorry you are going through the horrors of cancer. Stay strong and win your fight. Your dolls are wonderful- I am a doll nut!! I'd love to win. Please enter my name. If you'd like, pop over to my blog, I'm #983. Thanks!! Wow bella Nancey!!! You are one talented chiccie! Your life touches me, your dolls touches me... Maybe because we are both form the same pod! You should not be dealing with this tragedy, it is not fair! Please enter me for a chance at winning a lesson from you, that would be so fantastic! Your dolls are so beautiful, I enjoy visiting your blog, please count my in your drawing. I love your blog header!! This doll is just precious - Would love to have my name in the hat for this drawing. YOur little girl is a beauty!! She would be real happy with me!! Love and healing thoughts and hugs. I love the doll, please count me in. When you get a chance, fly by my blog on your magic carpet, I am OWOH #907. I absolutely love your dolls ! Thank you for participating to this year's OWOH ... Keep up the good work ! What a beautiful doll and giveaway. I am sending you many positive thoughts and prayers your way. Take care of yourself! Many blessings in this difficult time. There's a package coming your way. I'll be mailing it tomorrow. I would like to learn how to make this beautiful doll. I love your dolls and your blog. I am going through what you are with the chemo and all. Please visit me on my blog. Have faith and cherish every day. Beautiful beautiful to hear from you! Thanks. Love your banner and you know what a fan I am of your glorious art! Blessings. I hope that you are feeling better soon! I would love a lesson from you. I have always wanted a lesson about dollmaking. Your dolls are stunning! What a beautiful giveaway! Drop by 1008, too! What a wonderful doll. I think she is beautiful. Pleae enter me! Oh, dear.....so sorry to hear about your condition...but I know you can hang on and fight! You go girl! Take care and be blessed, dear. Oh! I love your dolls! Your Frida doll is stunning. Thank you for riding the carpet caravan! Be sure to visit me at #833! Hello Nancy from Victoria, Australia. I am so sorry to hear about your cancer. I wish you much luck with your treatment. I would love to learn how to make dolls like yours. Your giveaway is heavenly! Please enter me in the draw, and don't forget to fly my way (#922)! I love her, she needs to live at my house. please enter my name. Hello Nancy, Thank you so much for sharing your talents. Please count me in. Wishing you well and that you win this fight! its a lovely doll! please enter me in your drawing! great giveaway! she looks like frida! Your doll is so very pretty. She is lovely and would be "sitting pretty" on my shelf with other treasures if I am the lucky winner. Please enter me in your creative giveaway. Your prim art dolls and mixed media work is so amazingly beautiful. I would be thrilled to learn your techniques. I have made a few prims, but not nearly at the same level as yours. I'm a doll artist and I'd love to take your lesson! Oh Wow! What a huge amount of fun I would have taking a lesson. Your art dolls are so beautiful. I couldn't resist checking out your gallery of dolls right off the bat. Your giveaway is terrific! I would love a chance to win. Please add my name to your drawing! Thanks for participating in the OWOH event. I would love to win your give away, please include me. WOW! Your doll is GORGEOUS!!! Please sign me up! And please check out my blog for more OWOH action. Would love the chance of winning a doll making lesson from you! Thanks for adding my name to your growing list of hopefuls. Stop by my blog when you get a chance and enter my OWOH giveaway as WELL! Keep up the good fight with that ugly disease! I have sent prayers your way this morning. I love, love, love your dolls! I have been wanting to learn how to make them for a long time now, so I hope to win! Thanks for a great idea and I am glad to find your blog! your creations are just lovely!! I would love to win a lesson by such a wonderful doll maker, please enter my name into your drawing! And if you haven't already, please enter mine #135 to win 1 of 3 prizes!!! Love it! Please enter me in your drawing! Thanks! I hope that you have lots of love surrounding you to help you, and that your talent at doll creation will comfort you! Thank you so much for the chance to win, would love to! My thoughts are with you. Your doll is beautiful. Fantastic giveaway. I would love a chance to win. Please enter me. It's nice to meet you! Thank you for a chance to win your wonderful giveaway! I am sorry to hear of what you are going through. My Mother and 5 of her sisters have conquered breast cancer and if they can beat those odds you can. I wish you the best on your journey because that's how my Mom explained it. A new journey to a new and different life. My prayers are with you. Don't forget to visit all 3 of my blogs as I am giving away something at all of them! I would love for you to visit when you have time. Take care of you. I hope I'm not too late. I would love a chance to win. 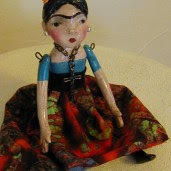 Frida beat many odds in her life and I think your giveaway doll is appropriate to what you are going through. Frida was a fighter and never gave up...what a beautiful inspiration to all women everywhere as you yourself have also been an inspiration to many, many ladies. I am sorry to hear you have been having such a tough time. Just remember you are not alone. I would love to join your class. I intend to learn to make dolls this year right after OWOH stops taking up all my free time :) so I hope I win. I am running out of time so I have to post and run but will be back! Please enter me in your giveaway. I am no. 26 on the Magic Carpet Ride.